From Monday to Thursday of next week, The Yoga Center will be opening their doors to host The Yoga Center Community Week. The week will be filled with activities and special offers aimed at getting people to know the center and meet their highly specialized trainers. The Yoga Center is the first and only female center specialized in yoga, with more than 10 different types offered, from pre-natal to breathing and hot. 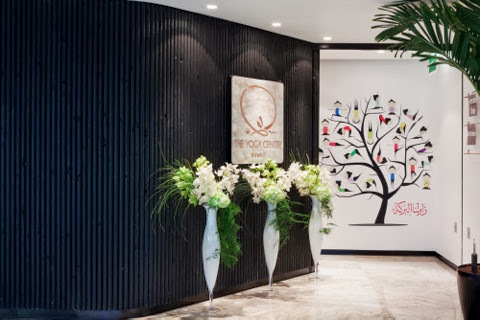 The hot room, with its sophisticated heating and humidifying system is the first of its kind in Kuwait, built to enhance the detoxifying and purification of the practice. Highly qualified and specialized trainers and small classes are built around the desire to provide each member with special attention. The Yoga Center aims to be a cove of serenity where members look forward to pamper themselves with luxurious interiors, marble-clad floors, and rain showers. Furthermore, members are able to tailor classes to their specific needs and ailments, like relieving back pain or breathing classes where they can shake off their stress and revive their senses. Attached to the studio is a yoga store where our Yogis in the making can shop carefully selected International yoga brands. For our community week, we will be offering special deals and discounts all week. If newcomers can't decide which class to sign up for before becoming a member, they can try one for FREE! So come on Kuwait, say it out loud, #IDoYogaKW!